It plays an important role in metabolism, essential for the normal functioning of the central and peripheral nervous system is involved in the synthesis of neurotransmitters. In the phosphorylated form provides a process of decarboxylation, transamination, deamination of amino acids involved in the synthesis of proteins, enzymes, hemoglobin, prostaglandins, exchange of serotonin, catecholamines, glutamate, GABA, histamine, and improves the use of unsaturated fatty acids, lowers cholesterol and blood lipids, improves myocardial contractility, contributes to the transformation of folic acid in its active form, stimulates hematopoiesis. 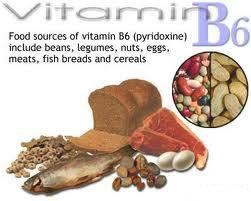 Atherosclerosis vitamin B6 improves lipid metabolism. conjunctivitis, polyneuritis of the upper and lower extremities. Lack of pyridoxine leads to a decrease in an indicator of the immune system as the number of T-lymphocytes. There is evidence of the effectiveness of pyridoxine in atherosclerosis and diabetes (lowers glycosylated hemoglobin), in addition, pyridoxine acts as a diuretic, helping to reduce high blood pressure, thus protecting the cardiovascular system of multiple ways. A number of studies pyridoxine shown to be effective in depression: it has a positive effect on the production of norepinephrine and serotonin. Pyridoxine in the treatment protocol included "the withdrawal of binge and hangover syndrome. Pyridoxine administered orally (after eating), subcutaneously, intramuscularly and intravenously. Parenterally administered vitamin B6 malabsorption in the intestine, as well as in cases where ingestion is not possible (eg, vomiting). Therapeutic doses by ingestion for adults is 0,02-0,03 g 1-2 times a day for children, reduce the dose. The course of treatment up to 1-2 months. Parenterally administered to adults 0,05-0,1 g / day (1-2 doses), children - to 0,02, the course of treatment for adults is 1 month for children - 2 weeks. In general, pyridoxine well tolerated. In some cases, possible allergic reactions (skin rash, etc.). When parenteral administration of vitamin B6 should not be mixed in one syringe with cyanocobalamin (vitamin B12) and thiamine (vitamin B1). Chelating compounds (complex ones "), such as penicillamine and cuprimine, bind and inactivate vitamin B6. Corticosteroid hormones (hydrocortisone and others) can also lead to leaching of vitamin B6. When you receive estrogen, soderzhaschih drugs, there is a strong deficiency of vitamin B6. Receiving Anticonvulsants and anti-TB drugs can lead to deficiency of vitamin B6, but in this case should be cautious in taking pyridoxine, since large doses can disrupt the action of the drug. Absorption and assimilation of pyridoxine are broken at regular use of alcohol products. Vitamin B6 may decrease the effectiveness of the treatment of Parkinson's disease.